Scotland is celebrated the world over for whisky and golf, so what could be more appropriate than today’s (2nd February 2012) announcement of a three year partnership, that will see Glenmorangie become the Official Whisky of The Open Championship. The pairing of Glenmorangie and The R&A organisers of The Open Championship, is a natural fit as both have huge global followings. Glenmorangie is enjoyed in over 130 countries worldwide and of course in the UK where it is Scotland’s favourite single malt whisky. The Open Championship is golf’s most famous tournament watched on television by an estimated 458 million households in 196 territories worldwide. Over 200,000 visitors flock to Britain’s finest coastal golf courses every year to enjoy the drama of The Open in person. Royal Lytham & St Annes Golf Club, near Liverpool, will be hosting the Open Championship in 2012 (15-22 July). Both Glenmorangie and The Open have a proud heritage dating back over 150 years. 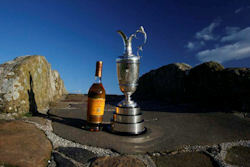 Glenmorangie was first produced in 1843 and is a leading player in premium single malts, whilst The Open is golf’s oldest Major Championship dating back to 1860 and offers the famous Claret Jug as its prize. Just as Glenmorangie goes to unnecessary lengths to craft its award winning single malt whisky - using the tallest stills in Scotland and only the finest quality oak casks - so The Open is renowned every year for its meticulous preparation of the greens, fairways and bunkers of each Championship course. Peter Dawson, The R&A’s Chief Executive welcomed Paul Skipworth, President and Managing Director of The Glenmorangie Company, to St Andrews, and expressed his delight at the partnership.